Chrysler released details on the tribute Jeep to the 75th anniversary of auto industry supply legend Mopar. The Jeep Compass True North is now on display at the Mopar event and will be showcased at the upcoming Chicago International Auto Show. The 2012 Mopar Jeep Compass is being called the "True North" edition and is on display at Mopar's 75th anniversary bash and will be shown to the public at the upcoming 2012 Chicago Auto Show. The special "Mopar tuned" Compass has some great improvements, though nothing that would substantially change its on- or off-road credibility. The Jeep Compass is a Trail Rated™ vehicle and the Mopar modifications don't change that. Most of them are in the aesthetic alterations that create the True North brand. First and most obvious is the awesome burnt-orange gloss that paints the Jeep. In subtle two-tones, accented by flat black, the Compass becomes a less suburbanite vehicle and enters the younger, more exciting realm of driving. The black is carried through on the wheels, undercarriage, faux side rails, and in the interior as well. A step inside shows that the black has a reason: the seating is covered in neoprene, that quasi-rubberish material that outdoors hipsters seem to love for more than just diving suits. That theme continues with a center-stack embedded pitch and roll meter, which (while functional) is almost assuredly more for looks than for use. Why do I say that? The main interior feature is its powerful Kicker sound system that makes this Jeep into a "rolling high-end sound studio" (Jeep's words). Mopar's real tribute to offroading is underneath the Jeep Compass True North edition: brush bars at front and rear. These are standard fare on hard-core offroader's vehicles, helping keep rocks and brush from catching in the undercarriage or smacking against important engine items like the oil pan. No matter what your view on the Jeep Compass' potential for off-road (or lack thereof), one thing is for sure: the True North edition from Mopar is by far the coolest-looking one you can get. So even if your idea of "off road" is to drive over the curb when parking, you'll at least be doing it in killer style with this special edition ride. 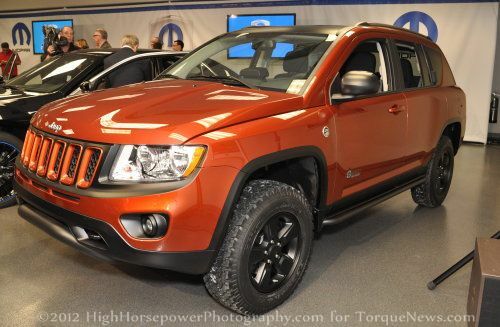 Off-road prowess tested by 4x4 Review and Motor Trend, both seemed impressed with 2011 Trail Rated Compass.